One of my students told me during our initial coaching session that he gets little bits and pieces of psychic hits -- small, specific details -- but that he hopes to achieve a stronger, more thorough connection where he can continue to channel additional intuitive information. Often, the smallest "nugget" of intuitive insight provides a lot more to work with than you might expect. And that additional, more complete, more thorough picture actually does not always come intuitively -- much of it can be achieved intellectually. The Intellectual Mind is not an adversary of the Intuitive Mind. The Thinking Mind can be a powerful ally, so long as it allows the Intuitive Mind to have its chance. The goal of the Intuitive is not to eradicate the Thinking Mind, but to use the Intellect to support the Intuitive. It's a powerful, useful relationship -- the roles are just often inverted in such a way that the Intellect hogs the microphone, upstages the Intuitive, drowning it out and never giving it a chance to contribute. Intuition is quiet, brief, subtle, and receptive. The Intellectual Thinking Mind is loud, wordy, repetitive, and projective. In the training we explore the relationship between Impulse and Synthesis. Impulses are the "dots" -- synthesis is how we "connect the dots," incorporating our intellectual frames of reference. Approach your goal of communicating psychic information like this: Allow the Intuitive Mind to deliver the package; then allow the Intellectual Mind to unwrap that package. The actual example from this conversation: The student told me he was picking up (intuitively) the image of colored lights moving around me. He said "That's all I'm getting though -- just colored lights around you." That's actually a lot to work with! It's a great starting point. A small package with a big story stored inside. The psychic vision is like a small knot of information delivered by the Intuitive Mind, but it can be unraveled by the Intellectual Mind in a very useful way. I coaxed him, interviewed him, questioned him in order to assist him in using his Intellect as a kind of forensic detective to further investigate the seemingly small clue supplied by his Intuition. How many colored lights do you see? Are the colored lights bright and vibrant? Or are any of them faded, faint, or dull? On what side of my body do these colors appear? What does the left side of the body indicate versus the right? Which side of the body corresponds with reception; which one with projection? What do each of these colors (traditionally) metaphorically stand for or symbolically mean? He "froze" the image in his mind, and examined that image with his intellect. When he counted, he saw that there were five colors represented. He named the five individual colors that he was seeing. He saw that two of the colors, blue and pink, were on the left side of my body; the other three on my right. I asked him then to interpret the significance of these details using his intellectual frames of reference -- not his intuition, but the information he has learned in past courses and books he has read. 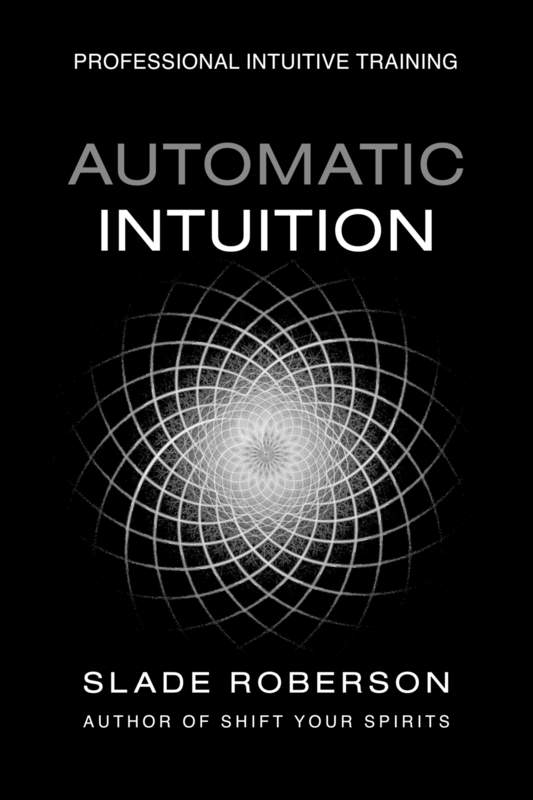 I asked him to refer to the Color Reference Charts in the Automatic Intuition workbook to assign potential meanings to the colors. He was able to supply a thorough list of meaningful details, not intuitively, but by intellectually elaborating on that initial, "small" first image. He was able to tell me a Story about my energetic state by synthesizing meaning from an abstract visual image in his Mind's Eye combined with external sources of knowledge. Had I been a client, I might not have known the right questions to ask -- but the next time he reads for someone and sees colors around that person, he can supply the same list of questions himself, use the same process. Client Confirmation I was able to confirm for him that whenever I have had my aura photographed, the right side of my body has always presented with more activity and colors. My aura tends to be heavy on the projective energy. Not only that, but the receptive side of my aura is nearly always where you will see the blues. What he was picking up was more rich in detail and more accurate than he might have first imagined. All you need is a small psychic impulse -- much of the meaningful details in a reading can be supplied by an intellectual process and intellectual references. The confirmation of how and why this information is significant will often come -- not from your intuition -- but from the client's feedback. Allow the Intuitive information you receive to be "small" -- remember (the cliche) that there is an enormous tree locked away in that little acorn.